The plant pathology program is responsible for research and diagnostics on plant pathology related issues within the Imperial County of California. The plant pathology program offers diagnostic services for growers and PCA's, enabling precise and timely diagnosis of plant diseases. There are many areas within plant pathology, including viruses, bacteria, fungi, and nematodes that the plant pathologist is responsible for keeping up to date with and relaying new information to the clientele. Examples include melon vine decline fungi, Cucurbit Yellow Stunting Disorder Virus, Iris Yellow Spot Virus, Melon Vine Decline, needle nematodes, stubby root, lesion, or root knot nematodes. Primary research focus is on researching integrated pest management solutions for soil-borne fungal diseases and nematode disease problems in Imperial County. Imperial county has a unique irrigated desert climate unlike any other place in the United States. The environment is host to a range of plant pathogens that are unique, but it also shares common plant diseases with other locations in the U.S. such as Pythium, Rhizoctonia, Powdery mildew, and Downy mildew. Vine decline of melons, a disease characterized by a sudden and field-wide collapse of mature fruit-bearing plants 1-2 weeks before harvest, has historically been attributed to Monosporascus cannonballus, a soil borne, root-infecting ascomycete. Recently, however, Melon necrotic spot virus (MNSV) has been reported as the probable cause of vine decline in Guatemala. This virus is seed borne and transmitted by Olpidium bornovanus, a soil borne, root-inhabiting fungus. Although the virus has not been reported to occur in the USA since its original discovery in a greenhouse in Riverside, California in 1979, preliminary studies by Stanghellini et al (unpublished) showed that the fungus is common in soil samples collected from 14 commercial cantaloupe fields in both Arizona and California (including soil from DREC). The presence of the fungus, coupled with the apparent absence of the virus, raised questions regarding the nature of the association between the host and the fungus. Specifically, could Olpidium bornovanus, acting alone, cause or contribute to vine decline of melons. Olpidium bornovanus has historically been regarded as non-pathogenic obligate parasite. However, recent greenhouse pathogenicity studies by Stanghellini et al (unpublished) showed that O. bornovanus is, in fact, a root pathogen, causing extensive root rot and significant reductions (>50%) in both shoot and root growth of infected melon plants. Currently, in collaboration with Dr. Stanghellini, we have completed one field season researching melon vine decline caused by M. cannonballus on melons. Greenhouse studies done by Dr. Stanghellini indicate that two chemicals, i.e., the surfactant Agral 90 and the systemic fungicide Quadris, can be used to mitigate root disease of greenhouse grown melons caused by Olpidium. The surfactant lyses the zoospores of Olpidium, but has no effect on M. cannonballus.Thus, we can selectively eliminate Olpidium by applying the surfactant and thus determine the role of this fungus in vine decline in the field. Greenhouse studies also indicated that the systemic fungicide Quadris exhibits efficacy in control of Olpidium. Grower testamonials indicate that Quadris may also control Monosporascus, but this fungicide has not been evaluated under field conditions. In our current project we are assessing the efficacy of Quadris for the control of both Olpidium and Monosporascus in the field and compare the efficacy of the later systemic fungicide to a currently registered nonsystemic fungicide (i.e., Cannonball) for control of vine decline in the field. Needle Imperial County is the only county within California that has the Needle nematode, Longidorus africanus. The Needle nematode is able to parasitize almost all the crops grown here in Imperial County. Carrots are especially vulnerable to damage by needle nematode, causing forking and stunting of carrots to make them unmarketable. 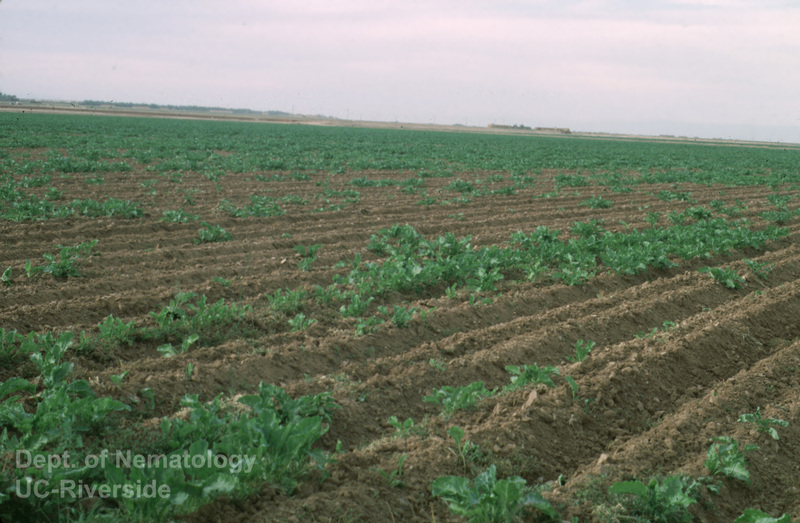 Other crops such as sugarbeets, lettuce, alfalfa, and melons are also vulnerable to nematode damage, but the damage and yield reduction is often attributed to other problems. Sugarbeet Cyst Imperial County is currently the only county with a sugar processing plant (Holly Sugar), and the last and only county to grow sugarbeets. The Sugarbeet Cyst nematode Heterodera schactii is a common and large problem for sugarbeet growers. Currently there are limited fumigant options for nematodes, and thus growers rely on a detection and nonhost cropping system for fields that have detected the nematode. 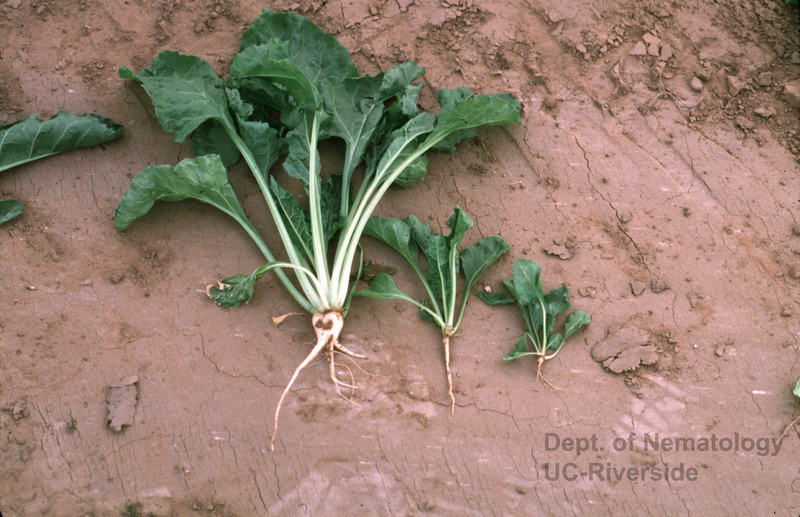 In collaboration with Dr. Westerdhal of UC Riverside we are conducting a research project investigating an IPM approach for sugarbeet cyst nematode (Heterodera Schactii) on cabbage will be developed using multiple techniques in combination, including trap cropping, natural products (e.g. DiTera, Quillaja, Root Power), and abamectin treated seeds so that each will provide partial control of the nematode population to achieve a higher level of control than can be obtained by either technique alone. Other research areas include Downy mildew on baby leaf lettuce, Powdery mildew in melons, melon cultivar lines resistant to Cucurbit Yellow Stunting Disorder Virus, and the impact of insecticides on reduction of Iris Yellow Spot Virus of onions. 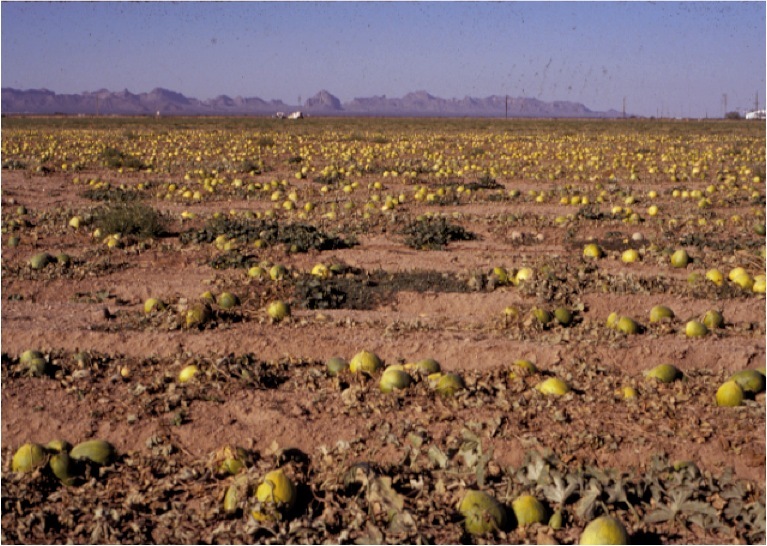 Melon Vine Decline is a common soil-borne plant pathogen found in the Imperial Valley and in other hot climates. The disease is characterized by sudden melon decline approximately 2 weeks prior to harvest, resulting in total yield loss. There are two soil pathogens most commonly found when diagnosing a field with melon vine decline, Monosporascus cannonballus and Macrophomina phaseolina. Symptoms on the root include reddish lesions, and M. phaseolina is characterized by a black rot around the crown of the melon. M. cannonballus and M. phaseolina both produce fruiting bodies on the dead or dying root system. Diagnostics of this pathogen is based on the production of these fruiting bodies. The fruiting bodies differ in size, with M. cannonballus characterized by large pycndia and M. phaseolina with smaller microsclerotia. The patterns of melon vine decline in the field also produce different patterns of decline, which can be differentiated by a trained eye. Can you see the difference below? Pythium spp. 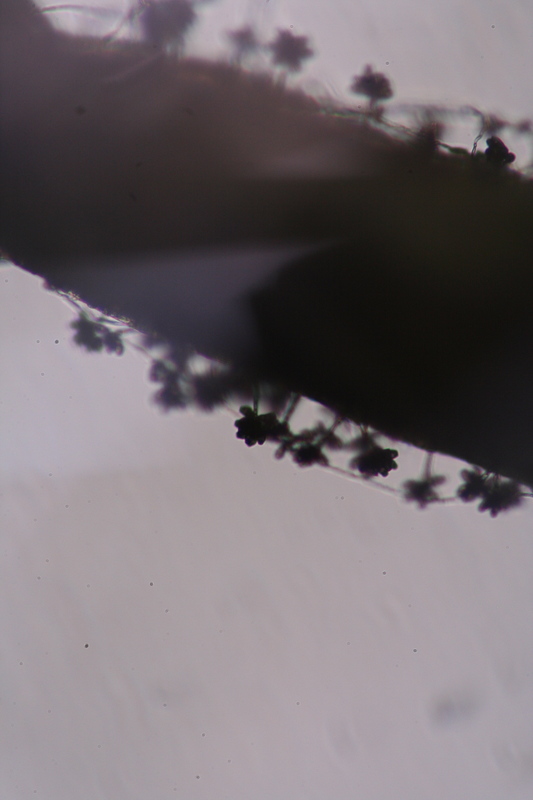 and Rhizoctonia spp. Pythium and Rhizoctonia are two soil-borne pathogens that are present ubiquitously in the soil, and can give rise to a major problem in many different crops. The most common plant disease in Pythium and Rhizoctonia is seedling damping-off. The small seedling is vulnerable to over-irrigation, during this time Pythium and Rhizoctonia can invade the seedling at the soil line. With a Pythium infection, the result is rot of the seedling at the crown, directly at the soil line. Pythium and Rhizoctonia can also be a problem in mature plants, under conditions of water saturated soil and plant stress. 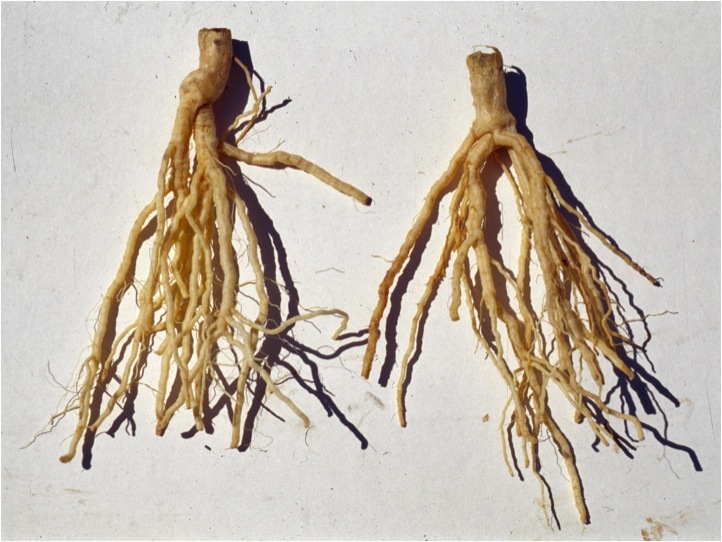 Rhizoctonia can also be a problem for mature plants of many vegetable crops, and is characterized by lesions on the root system. Rhizoctonia is also responsible for 'bottom rot' of lettuce, where lower layers of mature lettuce plants become infected with the soil fungus. These two pathogens are easily cultured in the lab for diagnostics with a microscope. Common foliar plant pathogens are usually fungi or viruses, including the Powdery mildews, Downy mildews, and insect transmitted viruses. Powdery mildews are obligate plant fungi, and can not be cultured in a laboratory. However, the characteristic powdery sporangia production is easy to recognize, and is usually the first plant disease recognized easily by growers. This fungus prefers moderate dry temperatures, and can easily become a problem for growers if not treated. Downy mildews are actually not fungi at all, but a class of organisms called Oomycetes. These type of pathogens prefer cool, wet conditions. 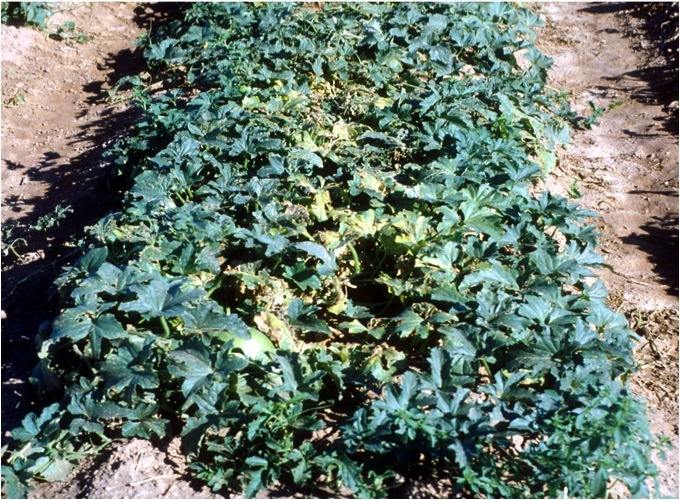 Downy mildew can occur in the desert, especially under irrigation practices that leave the field with leaf wetness for long periods of time. 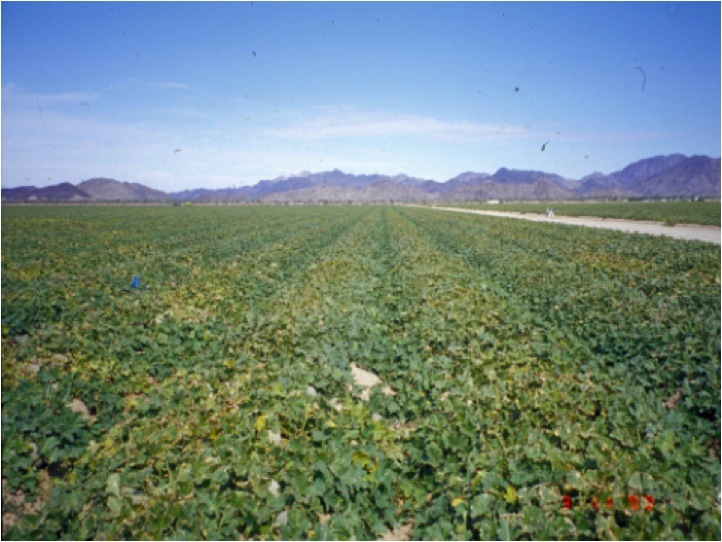 A wetter winter in the desert can be an opportunity for Downy mildew diseases to occur. This pathogen is also an obligate plant parasite, and is not culturable in the laboratory. Therefore, diagnosis of this pathogen is through visual evaluation of the sporulation patterns and plant damage patterns. Viruses Common plant viruses in the Imperial valley include Iris Yellow Spot Virus on Onions. 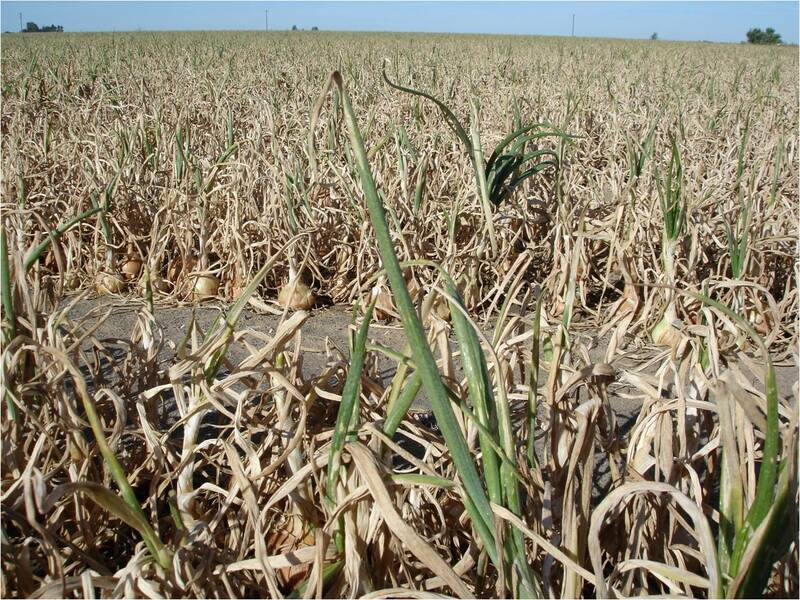 Symptoms of this virus include diamond shaped lesions on dehydrator and bulb onions, seed onions have symptoms that are rounded and appear to be similar to herbicide damage. See picture below. Other viruses include Cucurbit Yellow Stunting Disorder Virus, a very devastating virus of melons. Symptoms include mottled chlorotic patterns on the leaves, eventually leading to total plant death. There are many other viruses of interest. Diagnostics of viruses is firstly by visual evaluation. If the virus is not common, a laboratory assay can be done or the sample can be sent to a specialist at one of the UC campuses for PCR aided diagnosis. Monosporascus cannonballus foliar symptoms include a chlorotic strip down the center row of the crop. Macrophomina phaseolina infected field, with spotty random patches of chlorotic plants. Macrophomina phaseolina producing microsclerotia in culture. Turf grass sample infected with a species of Cercospora. Lettuce seedling with damping off symptoms from Pythium spp. fungi. Notice the rot around the crown, and chlorotic appearance. Needle nematode damage to lettuce seedling (right), healthy seedling (left). 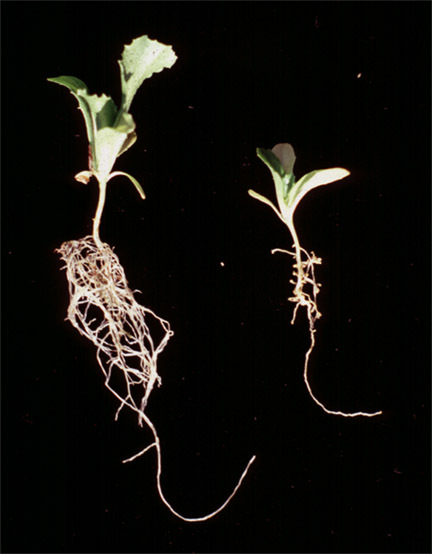 Sugarbeet plant with Needle nematode damage (right), healthy plant (left). Needle nematode (Longidorus africanus) feeding on root tip. Iris Yellow Spot Virus Damage on Onion Seed Crop. Cucumber Mosaic Virus in celery.